Harlem Village Green — The Rev. Linnette C. Williamson Memorial Park Association, Inc. The Rev. Linnette C. Williamson Memorial Park Association, Inc.
History: Built in 1994 by The Park Association, the property was named to signify its permanent use as a public resource while owned by our private, nonprofit land trust. 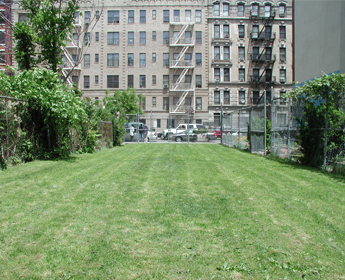 Harlem Village Green, formerly a vacant lot adjacent to Bowman Park, was purchased by The Park Association in 1998 with generous support from Apple Bank; Mary Flagler Cary Charitable Trust; The Charles Hayden Foundation; The J.M. Kaplan Fund; M&T Bank; New York State Environmental Protection Fund; The Norcross Wildlife Foundation; The Philanthropic Collaborative (a program of Rockefeller Philanthropy Advisors, Inc.); and The Trust for Public Land. The photograph of the dedication ceremony in 1998 shows the enlarged image of a grant check being held by New York City Parks Commissioner Henry J. Stern (left) and New York State Department of Parks, Recreation and Historic Preservation Commissioner Bernadette Castro (right). Standing next to Ms. Castro is Edward P. Bowman with Dorothy Morris third to the right of Ms. Castro.